Under “Most Recent”, the main blog content preview…. how can i show more content at the home page post (eg. 5-6 lines)? Is it possible to show the exact paragraph or content layout instead of continuous content without “enter or spacing to next line”. Can I add a “read more >>” link button at the end of every post? Thanks mourseben for your reply. Sorry i didn’t explain well.. I was trying to say how can i show more content in each post, not more post on main page (currently have set 7 posts on main page). Also, how can i put a page break (to show more content) and show “read more” link at the end of every post on the main page? You can add a page-break after Last updated. That should give you more words per post. 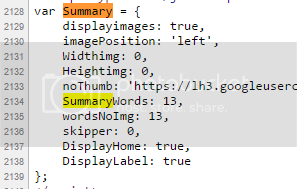 Also, you can find this in your template html. Change 13 to a higher number….preview and then save. Thank you LindyLou for your help. I have tried to change to a higher number (eg, 20, 100, 1000) now set at 500. But still it only show 2-4 extra word on every post. Is there any max word count? It all depends on what the designer put in. Usually changing the number, it allows someone add wording. Try a smaller number, than 500. I see that this template is encrypted, there for there is no way to add more summary words. If you love the template, then you should contact the designer. Noted with many thanks. I will contact the owner / creator of the template. Thank you for your time.. Cheers!